DO NOT use tap water. Tap water is full of chemicals that are not good for your houseplants (or you). If you drink filtered water, then you know that the tap water smells and tastes like chlorine. Have you ever had a pot that has the white salty substance on and around the soil and edges of the pot where the soil meets the pot? What if I told you that this could be from the chemicals that were in the water. I have rain barrels so I use this water to water all houseplants and container pots in my garden until Jan and Feb when it is just too cold to go out and fill my water jugs. So what do I do for water? 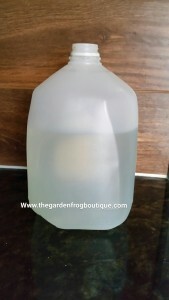 I recycle/upcycle plastic milk jugs that are used strictly for houseplants. I fill the jugs with tap water and let sit for at least a day so the chemicals dissapate. In most cases the water sits for days until the next time I water. I have been doing this for about 35 years now since growing houseplants as a teenager. 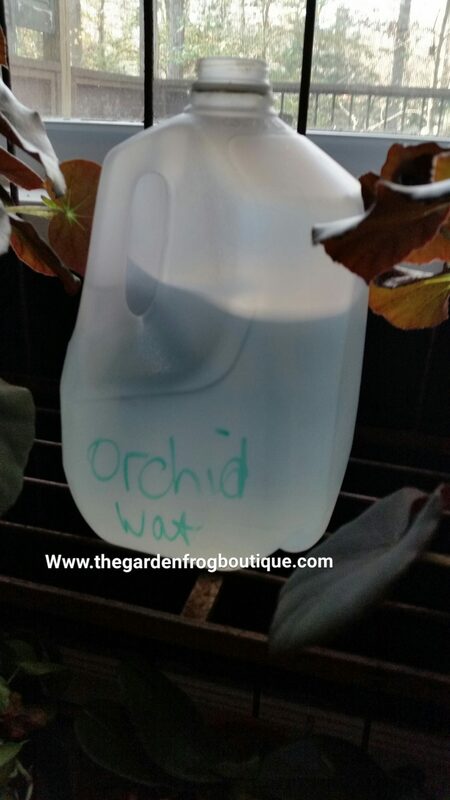 Depending upon the pot size, I water about 1/4 cup for small pots under 6″ to 1/2 cup for 8″-10″ and 1 cup for my large plants. There is no science for me as I just get a feel for what each pot uses; and if you have a good pot with drainage, then the excess water will run out. If after a day there is still water in the dish or saucer under the pot, then you are watering too much and I would empty it. 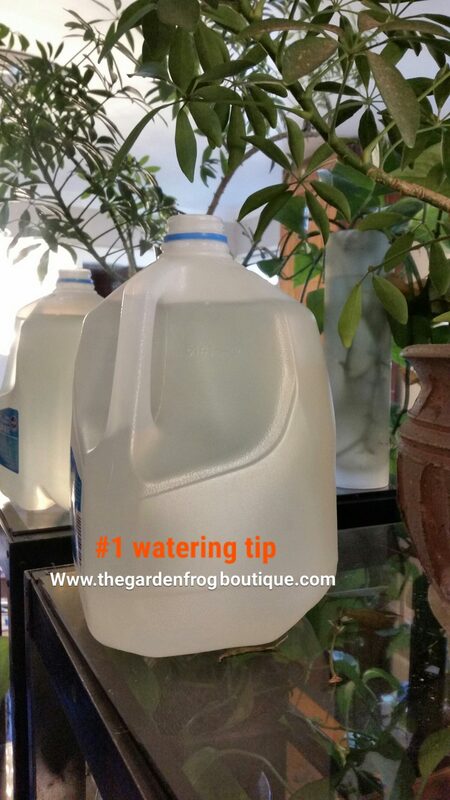 Watering is so important to your plants and if you have had trouble growing plants in the past, then I may add that watering could have been the reason why you had a “brown thumb”. Thank you for stopping by! If you ever have a question, just contact me and I will get back to you as soon as I can. Great tips! I’ve noticed the white crusty stuff on bottom of pots before but it never crossed my mind that it could be the chemicals in the water. Thanks for sharing! What an easy to do idea! I don’t grow a lot of houseplants but I do have some. I have always used tap. I bet that explains why I don’t have a lot of success! Thank you! IN my area our tap water is so full of chemicals that I have almost killed plants by watering with it. Good luckin the future with houseplants! Great tip! Thanks for sharing it. My water is horrid here. I am very fortunate in that we have completely untreated well water! Living in the boonies sure does have it’s advantages!